Saturdays in Miami typically have no shortage of glamour, drama and excitement. However, April 22 featured a different kind of excitement. The March for Science was only a pre-game for thousands of South Floridians who made their way down to the Bayfront Park Amphitheater to experience a pulsating reggae music festival on a rainy night in South Beach. From the initial downbeat shortly after 1 p.m., the festival brought massive crowds to their feet just a few blocks from the AmericanAirlines Arena. 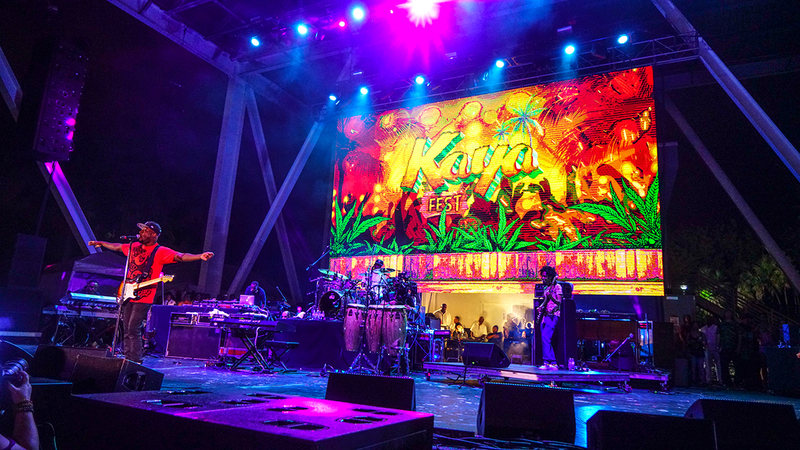 Sean Paul, Lauryn Hill, Skip Marley, Inner Circle and Cultura Profetica headlined the event, which was held to raise awareness for the controversial use of Cannabis for health purposes. The festival’s intensity only picked up more steam over the course of the day, as Sean Paul kicked off the evening acts with an elaborate group of DJs, dancers and crowd-pleasing hits. “I just love music and love bringing people together,” said Marley in an interview with The Miami Hurricane before the show. Marley provided insight into how the Miami music scene led him to take the high-profile gig. Marley’s performance came alongside several other notable performing relatives, such as Ziggy, Damian, Ky Mani and Julian, comprising the Marley Brothers. Marley’s musical background is far denser than his surname alone. His unique ability to teach himself the ins and outs of various instruments has been a key part of his diverse and well-versed reputation. Marley’s diversity and instrumental unpredictability has drawn comparisons to the late Prince, whose timeless hit “Kiss” was played, garnering a sentimental cheer from the drenched audience. The 20-year-old Marley was born in Kingston, Jamaica, but raised in Miami. Marley’s career follows a similar trajectory to his fans’ love for Bob Marley, but his chart-shattering success did not come without influences from people outside of his lineage. “A lot of my grandfather’s and family’s music has inspired me, but some artists, such as Jimi Hendrix, B.B. King, John Mayer, Kendrick (Lamar), a lot of folk music [also inspire me],” Marley said. Kaya Fest was a resounding success for the performers. A massive crowd was thrilled wire-to-wire on an overcast night. Whether or not the festival’s goal of advancing the possibility of legalizing cannabis was accomplished, Marley once again “brought everyone together.”.